Who Has Given The Rights To Kill Yourself??? Source: Who Has Given The Rights To Kill Yourself??? PLEASE, PLEASE read if you or anyone you know drinks diet soda. 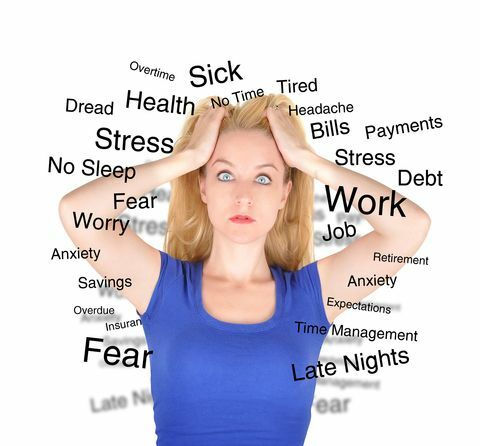 Stress: What Are Your Coping Mechanisms? Public Speaking. Speaking in Public. Speaking to a large group of people. Speaking to a room full of your peers. There is an old adage that says some people fear public speaking more than death. I have never understood that because the opportunity of sharing to a group of people is one of my greatest pleasures. I love to make people laugh, cry, relate and to encourage and motivate them. If this is an area that you struggle with, I may have learned a few things that will help you. One of the most important things you must learn is what you do in the first six seconds. If you walk up to the microphone and start to speak before you get there, it shows your nervousness. First impressions are huge and you want to give a good one. So, the first six seconds – don’t say a word. Pick up your microphone, look at your audience and smile. In these first six seconds your audience is analyzing you. They don’t hear what you say until they have had a good look at you. Of course, it is necessary to present yourself well in your appearance but, and this is a very big BUT, it is not what you wear or even necessarily what you say that is the most important. You can enunciate perfectly. You can be the greatest orator. You can articulate clearly. However, if it comes from a cold place, your audience will perceive it and inevitably tune you out almost immediately. As you become aware of this, it makes you even more nervous. People don’t care how much you know until they know how much you care. That bears repeating. People don’t care how much you know until they know how much you care. It does not matter what you are speaking about, do it with passion. You cannot find passion in a book. You cannot find passion in any store. No website sells passion. Your passion comes from within and people will recognize it very quickly. I have been in sales most of my life and I have never sold anything I am not passionate about. I am a health coach and a lot of people that arrive at my office are in a desperate place. They are looking for answers. They need help. When I was in my twenties a doctor told me I had two choices. I could have a hysterectomy or die within two years. He was just that cold about his diagnosis. An anger rose up inside me and I stood up in front of his desk and said “I will not accept those choices. I will find an alternative!” He then stood up, shook his finger in my face and said “Then, Lady, go home…suffer… and die!” With even more rage I retorted “I will walk in here pregnant one day!” And I did – 14 years later. My point is, you need to be passionate about what you are speaking about and people will listen. When you are speaking in public, you are selling yourself first, your product second. Speaking to a group is like giving a gift to someone. When you do it from a place of love and compassion, you are not doing it because you have to, you are doing it because you want to. This is key to being a success. So, how can being warm and fuzzy help me when I speak in public? It does not matter what you are talking about. It does not matter what you are selling. If you believe in what you are doing, if you are passionate about your subject, your audience will notice and reciprocate – making you very comfortable and relaxed. So when you are preparing your speech, think about what it really means to you. Why is it important to you? How can your product or service benefit others? Think of what your audience needs and how you can give it to them. They will recognize your motive and you will be successful. If Your 15 Year Old Dog was Brutally Attacked, What Would You Do? On January 6, 2012 I was walking my 15-year-old Miniature Dachshund, Texas. We were walking in a wooded area and my husband was about a mile away running our Black Lab, Mercedez. I noticed a woman walking a Bull Mastiff that was not muzzled and was wearing a small collar. As they got closer, the large dog took three leaps towards Texas. She did not bark or growl. There was no indication that she was about to attack. She was no match for the woman who was walking her and pulled away easily causing her owner to fall. Molly, the large dog, grabbed Texas so quickly I did not have a moment to pick him up out of harm’s way. He was in the mouth of this dog who violently shook him for a full five minutes. Molly’s head was the size of my Texas. I did everything humanly possible to release her hold. I screamed so loudly that I damaged lung tissue and was feeling ill. I kicked her several times but she would not release little Texas. Finally, I gave her a hard kick to the groin and she dropped him. Within moments, my husband approached us in the truck and I yelled at him to open the tailgate as Texas had been attacked. I picked up my mangled little buddy and didn’t know if he would live or die. We assessed very quickly what happened and realized the woman with the Bull Mastiff was swiftly walking away. I ran after her and confronted her about the dog. The woman claimed the dog was not hers. She was walking it for her uncle who was in Hawaii. I knew that we had an emergency on our hands but had the presence of mind to ask the woman to call my cell phone so that I would have a record of the phone number. The woman was reluctant but I can be very convincing. She did not even offer an apology and was trying to move swiftly away. We were about five miles from the closest veterinary hospital and drove as fast as possible, blowing the horn and flashing our lights. I called a friend to alert the hospital we would be arriving. Two compassionate gentle nurses attended to Texas. They were amazed at how calm he was but alarmed at his condition. It took about an hour to assess the damage and we had to make a decision. It appeared that no organs were affected which was a determining factor in our decision. The doctor said the only thing that saved his life was his fat. This is a dog that spent the first 12 years of his life as a stud (27 litters) and he also had a full time job running the horses out to pasture each morning and bringing them home at night. He had been kicked many times by the horses but always knew he was in charge. I looked my husband in the eye and asked if we should say good-bye. My mother-in-law had died three weeks earlier and Texas was my husband’s best friend. We could not say good-bye yet. The tears on his back extended the width of his body and his skin was ripped away causing extensive damage. His leg and shoulder were severely torn open and one of his teeth was broken off. We determined that he got one good bite into his attacker. Texas was our little buddy and I was heartbroken. He just stared at me, obviously in shock and certainly confused and scared. Prior to doing the surgery, the vet told us that Texas would probably not handle more than one and a half hours of surgery due to his age, so he couldn’t make any promises. Surgery lasted three and one half hours. The doc said that his blood pressure or heart rate never elevated and he could not believe how healthy he was for a 15 year old dog. He said Tex had more stitches than any animal he had worked on. Instead of using staples, he individually tied each of the 150 stitches to help avoid infection. The hospital stayed in close contact with me through the evening. When I picked him up the next morning, there were no guarantees if he would make it. For the next three weeks, my husband slept with him on the sofa, changing his bandages every hour as there was so much drainage. He was on strong pain killers and I was glad he was not in pain. When he went in for his check-up we were told that they would have to do another surgery as most of the skin on his back had died from the damage and they would have to cut it away and restitch him. This surgery lasted close to two hours. Another three weeks of sleeping with him and nursing him 24/7. We sent kudos to the hospital in the local paper and five people came forward whose dogs were attacked by the same dog and each time the owner ran away. No one had been able to get any contact information previously. I was determined these people would pay for the vet bills and they did, to the tune of $7,000. I gave each of the other people, whose dogs had been attacked by this same dog, the owner’s contact information. 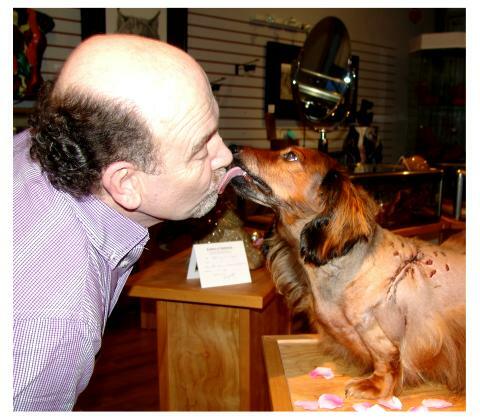 The newspaper in our town had a photo contest of the best kiss on Valentine’s Day. I just couldn’t resist and submitted the attached photo and won second prize. Within a few months, Texas was back to running and enjoying life. He seems to understand the importance of living life to it’s fullest. In some ways, he seems younger than ever. That was almost 2 years ago and he is still as active. Another year passed and bliss walked into our lives. We adopted our perfect little boy. We raised him as our own and loved him unconditionally through many difficulties. This is the role I was meant to play. Nothing made me happier than being a mother except becoming a grandmother of not just one grandson, but two. I cried a lot of tears but they were tears of joy. Living near our son and his wonderful family was the fulfillment I had always dreamed of and hoped for. Without warning of any kind, the day after our wedding anniversary celebration, our son announced he was walking away from our family. There was no room for negotiation. It was worse than divorce and much more like a death. Shock is not a powerful enough word. A stab in the heart is not a strong enough explanation. My doctor told me that dying of heart break can actually happen and I had all the symptoms. I promised you the NUMBER ONE reason to switch to a natural food diet and here it is. There are several large dog food manufacturing facilities that purchase euthanized pets from veterinary clinics to be ground up and used in their dog food. Even more disgusting they don’t bother to remove the collars, leashes or plastic bags from the dogs. These companies will also buy road kill. If this is not enough for you to at least check out a natural diet……..